Wishing you a Happy Easter.....looks like it will be a beautiful day. Just a quich note to let you know we do have our Buck A Blocks going. We have 3 versions a Primitive Red, White and Blue, a Flannel in golds, greens and browns and a Batik multi colored in blues, greens, pinks, lavenders and more. This years quilt is a basket quilt. 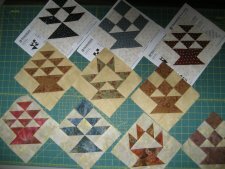 While we do not have any of them completed (due to fabric arrivals) we do have the block available to see. You may pick up the first four blocks for just $1 each and the price of one package of thangles. I have included a picture of the blocks. Enjoy your weekend and leave a little time for a couple stitches.